A trio of 2013 Forest Babies 1/2 oz Silver Proof Coins is now available from the Perth Mint of Australia. Shown on their reverses are colorful designs of a young Grey Wolf, young Red Squirrel and young Brown Bear within their natural forest settings. Each of the proof coins is struck from one-half ounce of 99.9% pure silver. Each also features a limited mintage of 10,000. "The irresistible 2013 Forest Babies coin series features stunning original artistry, capturing each creature’s innocence and playfulness," indicates the Perth Mint. Designs were completed by Perth Mint artist Aleysha Howarth. Her Grey Wolf image shows the pup sitting with its head slightly cocked as it peers toward the viewer. The Red Squirrel design places the creature on the branch of a tree. Her last image shows a Brown Bear sitting with an inquisitive-like stare. All three reverses feature the forest babies colored in their natural hues. They are set amidst frosted and colored representations of forest flowers. 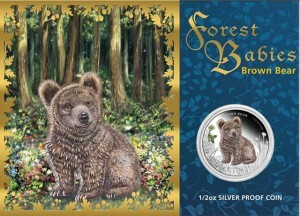 Inscriptions around the forest babies read 1/2 OZ 999 SILVER along with GREY WOLF, RED SQUIRREL or BROWN BEAR. These silver proof coins are struck as legal tender of the island nation of Tuvalu by the Perth Mint of Australia. Obverses have inscriptions of TUVALU, 50 CENTS, 2013 and QUEEN ELIZABETH II encircling the Ian Rank-Broadley effigy of Queen Elizabeth II. 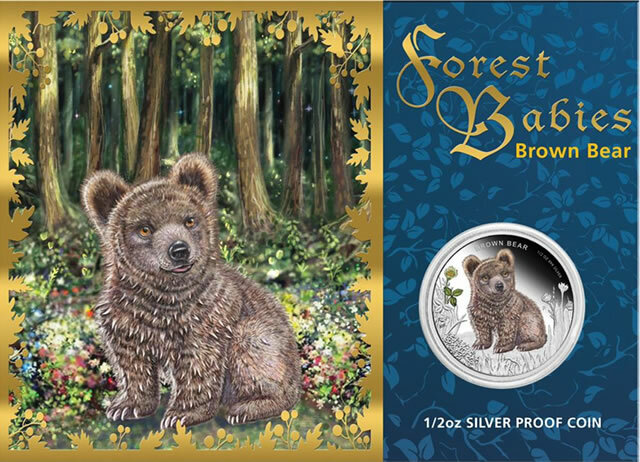 Coins are housed on illustrated presentation cards that offer another artistic representation of the forest babies. Prices for each coin are AUS $53.64, or US $54.67, but those are subject to change based on market conditions of silver. 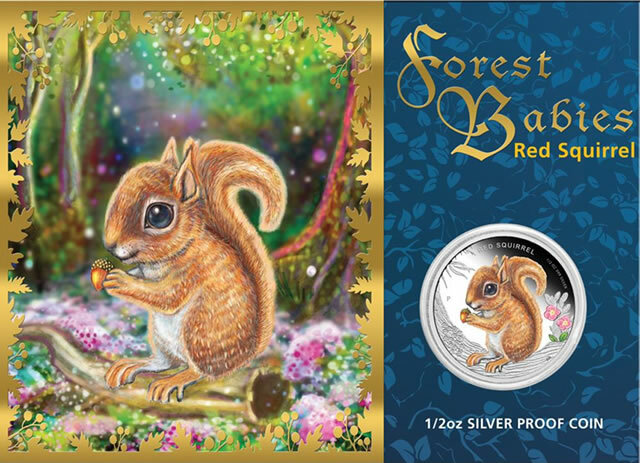 A three-coin bundle pack is also available that includes the 2013 Grey Wolf Silver Proof Coin, the 2013 Red Squirrel Silver Proof Coin and the 2013 Brown Bear Silver Proof Coin. Pricing of the 3-coin set is listed initially as AUS $150.91, or US $152.81. 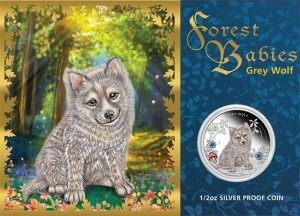 Orders for the individual 2013 Forest Babies 1/2 oz Silver Proof Coins or the related three-coin bundle may be placed directly with the Perth Mint of Australia at www.perthmint.com.au. Initial pricing is listed at AUS $97.27, or US $99.74.